Ireland's horse industry is famous throughout the world. We not only produce top class racehorses but we also produce some of the best sports horses as well. Currently 53,000 people are employed in the sports horse sector in Ireland with many hundreds of thousands of people having horses as a hobby. 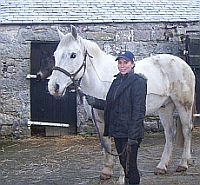 Horses are everywhere in Ireland and there are placements available in a wide range of horse farms. We have placements from stud farms with many employees through to small family yards, riding schools, and families who breed, train their own young stock, and compete locally. If you are particularly interested in competition horses or showjumping, we can place you where you can develop these skills and help you understand how such a yard runs, and how to bring on the competition horses. If you would like to gain experience in general horse care, then maybe one of our riding centres will suit better, or a friendly equine family might be more for you. Whatever the placement, you will be required to help with all aspects of the care of horses, such as mucking out stables, sweeping yards, grooming horses and, depending on an applicants riding ability, some riding opportunities. If your interested in horses, but not a such a serious level, then how about a short-term placement helping a family with caring for children and their family horses and ponies? Check out our Home & Horse placements.